Environmental Charter Schools’ Green Ambassadors Institute brings dozens of educators together for a walk, bike and sail to explore research in action. “It is important to not limit our thinking to just exploring tropical rainforests or the polar ice caps, but also consider what’s happening right here in our own neighborhoods,” said Polly Kim, a science research teacher at Milken Community High School in Los Angeles who attended Environmental Charter Schools (ECS)’s very own Green Ambassadors Institute (GAI) this past Saturday, February 25. Kim joined more than 60 other Southern California educators in Downtown Los Angeles for the second of three three sustainable education-focused professional development experiences as part of GAI. Attendees of the first event back in October 2016 came together for workshops and collaborative sessions introducing them to this year’s theme: 'Research in Action." The series’ natural next step was to further explore research out in the field. So it turns out Kim signed up for just the right thing. “We need to help teachers learn about resources that they can use to inspire their students to help the environment. It needs to come from us,” she added. ECS, with support from Boeing, West Basin Municipal Water District, Southern California Gas Company and more than a handful of organizations, developed three field trips equipping educators like Kim with accessible, hands-on experiences to promote sustainable education. With 5 Gyres Institute and the Los Angeles Maritime Institute, attendees set sail into the San Pedro harbor to research the impact of plastic pollution. Joining Kim on the wooden tall ship was Amy Johnson, a math teacher from San Pedro. “Saturday learning. On a tall ship analyzing trash from trawling the harbor,” she tweeted. Attendees sifted through plastic debris collected from the harbor. According to 5 Gyres, a single plastic microbead can be 1 million times more toxic than the water around it, with more than 600 species impacted by plastic’s improper disposal, through ingestion or entanglement. Most of this plastic is land-based waste that ends up in the oceans. On the second of the three simultaneous field trips was Xochitl Gilkeson, a high school teacher from El Camino Real Charter High School in Woodland Hills. Gilkeson teaches English but attended to integrate environmentalism across the school curriculum. “My tendency is to develop research plans and projects that keep the research just in the classroom,” she shared. “But helping our students change the lens they bring to what they are learning is really exciting.” Gilkeson is one of 10 recipients of a minigrant awarded by GAI to implement an environmental service learning project with students. She joined the Los Angeles Conservancy to explore the city as a model for sustainability–and as a multidimensional learning lab for her students. In the form of a walking tour, Gilkeson and other educators followed the Conservancy’s Director of Education, Sarah Lann, into some of Downtown LA’s reinvented historical buildings. Lann primed educators-turned-tourists for the walk, sharing that “preserving a building is the ultimate act of recycling,” to quote Richard Moe, president of the National Trust for Historic Preservation. Walkers stopped at the Continental Building, one of Los Angeles’ first skyscrapers now converted into apartments, and the Bradbury Building, the oldest commercial building remaining in downtown, among others. And while Gilkeson gained perspective on foot, a third group rode bikes with the Los Angeles County Bicycle Coalition to imagine the future of transportation in an urban landscape. On this trip was Francisco McCurry, a tenth grade English teacher at ECHS among the ECS staff looking to broaden their horizons, too. 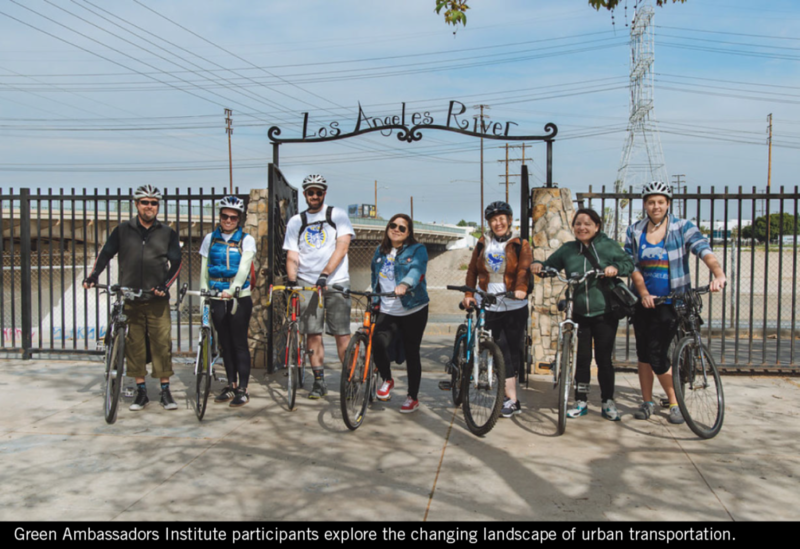 During the bike ride along the Los Angeles River bike paths, attendees also explored the possibilities of urban transportation here in the city and beyond. Among the highlights: green infrastructure, more free bikes, and workplace bus passes. Whether on foot, wheels, or boat, Los Angeles was quite the learning lab for educators looking to put research into action. “Get your kids organized,” said Marcus Eriksen, Research Director and co-founder of The 5 Gyres Institute. At the end of the day, it’s all for the students. Part three of GAI is a showcase featuring teacher- and student-led service learning projects that were awarded $300 mini grants back at October’s launch event. To register, head to greenambassadors.org/register by May 1.